The Turkish Foreign Ministry announced on Wednesday that the nation had already begun sending “humanitarian aid” relief packages to refugees fleeing the war-torn nation of Yemen, and that it was preparing to continue sending food and medicine to the region. It marks the first Turkish presence in a war in which Iran and Saudi Arabia are both backing opposite sides of a civil war. 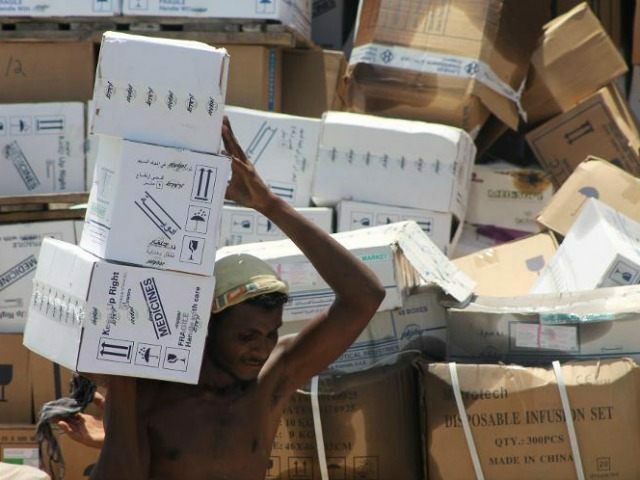 Hurriyet Daily News reports that a Foreign Ministry spokesperson confirmed that Turkey had already sent “humanitarian aid, mainly food, to Yemeni refugees in Djibouti over the past week.” Turkey fully plans on continuing shipments, including four tons of medicine, to the African nation, the statement concluded. The statement remained ambivalent politically, demanding only that “legitimate state authority” return to Yemen as soon as possible. The move is notable as Turkish President Recep Tayyip Erdogan initially harshly condemned Iranian intervention in Yemen, as Shiite Houthi rebels took over the capital, Sanaa, forcing President Abd Rabbuh Mansur Hadi to flee to the south of the nation. In March, following an announcement that a coalition of Arab nations led by Saudi Arabia would begin airstrikes in the country to defend Hadi and Sunni officials from the Houthi rebellion, Erdogan accused Iran of tipping the scales of the conflict towards the Houthis and “annoying us” with its intervention, implying that Turkey was considering adding military reinforcements to the Saudi coalition. Erdogan visited Tehran in April, however, and returned from the trip, apparently on friendly terms with the Iranian regime. Turkey did not send troops to fight the Houthis in Yemen and appeared poised for neutrality. Iran and Turkey continued to publicly claim they were cordial despite their disagreements, most prominently regarding Turkey’s opposition to and Iran’s support for Syrian President Bashar al-Assad. “In many areas, we see Turkey as a partner, not a competitor. We have common denominators, we can work together,” Iranian Vice President Masoud Soltanifar said in an interview with Hurriyet in which he clarified that Erdogan “did not speak of” Yemen upon visiting Tehran, making the situation much more comfortable for both parties. Most recently, Iranian Foreign Minister Javad Zarif and Turkish Foreign Minister Mevlut Cavusoglu met on Tuesday in Kuwait to discuss bilateral ties. In this visit, the topic of Yemen did surface, but only in the context of humanitarian aid, according to reports about the meeting, which occurred before the 42nd Session of the Council of Foreign Ministers of Organization of Islamic Cooperation. The Turkish diplomat, reports claim, emphasized the need for humanitarian aid in Yemen. The Houthi rebels suffered their first major setback since taking over Sanaa on Monday, being driven out of the southern city of Dalea by groups of Sunni militias believed to be loyal to President Hadi.